Sussex County, Delaware Sheriff Jeffrey S. Christopher has been thrust into an unenviable position. He’s being forced to defend, to the death, the oath he swore to the United States Constitution, against a political and ideological machine intent on stripping his sheriff’s office of any meaningful duties. Sheriff Christopher filed a lawsuit against this Constitutional and common law encroachment, and on March 8 the case was heard before a county judge, who ruled on March 19. Prior to the ruling, in order to gain a fuller understanding of the case, on March 15 AMERICAN FREE PRESS conducted an exclusive interview (46:45) with Sheriff Christopher, who was born and raised in Maryland into a police/military family. A national and state effort is underway to diminish and then destroy the office of the sheriff across the country. AMERICAN FREE PRESS contributing editor Pat Shannan has consistently covered this topic over the years, most recently writing about statutory gun-control laws that have been signed into law or are being formulated in the wake of the Sandy Hook shooting last December. “Now my deputies and I have been relieved of all arrest powers and can’t even make a traffic stop,” he said. “Delaware has only three counties. . . The other two sheriffs . . . will not stand up with me” to prevent the elimination of county law enforcement, he said. Delaware’s first sheriff took office in 1669. A few months after Shannan wrote about this matter, Delaware’s governor signed into law House Bill 325, which curtails the power of the sheriff even further, removing the term “conservator of the peace” from the legal language used to define the office of sheriff. Almost immediately, Sheriff Christopher filed suit. Sheriff Christopher is taking this challenge to his office very seriously. Sussex County, Delaware Sheriff Jeffrey S. Christopher has been thrust into an unenviable position. He’s being forced to defend, to the death, the oath he swore to the United States Constitution, against a political and ideological machine intent on stripping his sheriff’s office of any meaningful duties. Sheriff Christopher filed a lawsuit against this Constitutional and common law encroachment, and on March 8 the case was heard before a county judge. On March 19 a county judge ruled against Christopher and in favor of the state of Delaware’s plan to neuter the office of the sheriff. 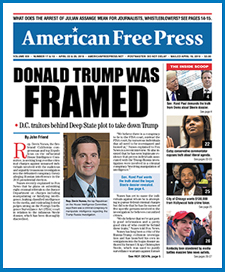 Prior to the ruling, in order to gain a fuller understanding of the case, on March 15 AMERICAN FREE PRESS conducted an exclusive interview with Sheriff Christopher, who was born and raised in Maryland into a police/military family. “I learned very quickly about honor, the Constitution and the Founding Fathers,” he said. AFP asked if there were arrest powers in Delaware prior to the latest assault on the sheriff’s office. “Yes, in fact, the person who had a large hand in creating House Bill 325 was Representative Pete Schwartzkopf,” a retired captain from the Delaware State Police, who admitted in an interview that “I’m not saying that they didn’t have powers, I’m just saying that they don’t have powers now.” Schwartzkopf’s assault on the sheriff’s office began in 2007. According to an Internet post on the Delaware Democratic Party website, “House Bill 325 was prompted by concerns surrounding the Sussex County sheriff’s office, which has conducted traffic stops and made arrests, despite multiple opinions from the Attorney General’s Office and being prohibited under state law from acting as a police officer. The Sussex sheriff contends that a line in the Delaware constitution that says that sheriffs are ‘conservators of the peace’ gives him that authority.” The Attorney General of Delaware is the older son of U.S. Vice President Joe Biden, Joseph Robinette “Beau” Biden III. Sheriff Christopher, who makes “about $20,000 a year,” explained the erosion of the responsibilities of the sheriff. “I think what happened, for whatever reason, the counties began to give the state more and more say so in the policing field…because the state had more resources,” he said. Due to the huge population explosion in Sussex County specifically over the last 10 years, Sussex County has contracted with the Delaware State Police to provide services. “We had 1,500 home invasions and burglaries in Sussex County last year,” explained Sheriff Christopher. Sheriff Christopher, who works closely with Sheriff Richard I. Mack, the founder of the Constitutional Sheriffs and Peace Officers Association, believes this case has national implications. AFP asked if the other sheriffs in Delaware’s two other counties were standing behind him. AFP asked if he’s been made to feel uncomfortable doing your job. AFP asked if he was actually assaulted. AFP asked what happened after that? Sheriff Christopher explained that he’s prepared for this matter to get ugly. AFP asked if he’s not going to give up. Sheriff is the chief law enforcement of the county. See memos posted here. The U.S. Supreme Court has concluded as supported by more than 800 years of history: “The Sheriff is the ‘Chief Executive and Administrative Officer’ of a county chosen by popular election. His principal duties are in aid of the criminal and civil courts of record (common law courts); such as serving process, summoning juries, executing judgments, holding judicial sales and the like. He is also the chief conservator of the peace within his territorial jurisdiction.” Harston v. Langston, Tex. Civ. App., 292 S.W. 648, 650 Sheriffs and U.S. Marshals need not feel intimidated by Judges, Attorneys or other elected officials. The duties, responsibilities and authorities of the Sheriff and Marshal cannot be diminished by those in the legislature, courts and state constitutions. According to Marbury v. Madison, which has been well-settled law for more than 200 years, the commission of the U.S. Marshal, being the Chief Law Enforcer, is the sole act of the President of the United States Article II Section 2 Clause 2; once the Secretary affixes his seal to the act it cannot be undone, not even by the president. Thereby, like the Sheriff, so is the U.S. Marshal, in that only the People, through an indictment, can remove him from office for not upholding the “Law of the Land”. As concluded by Marbury v. Madison, if it were not the case, they could not enforce the law unimpeded as Chief.